A prolific designer, with lots of ideas, a clear vision and a relentless drive to put Dutch design on the world map. When you love birds and sleek design than the Canal birdhouse by Frederik Roijé is the birdhouse of choice for you. A black-stained canal house made of weather-resistant plywood with brass nails and a brass twig. You can choose from a clock gable, a stepped gable or a whole row canal houses of course. Who are you going to surprise with such a nice eye catcher for the garden? 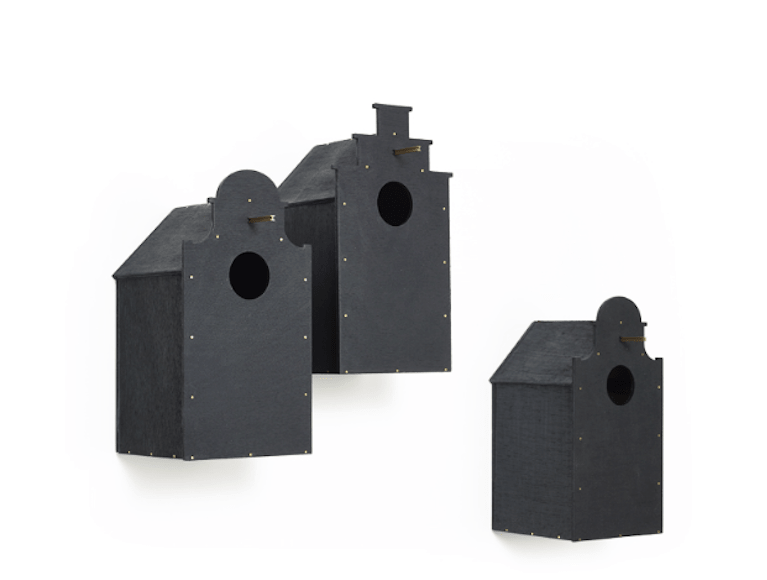 The Canal birdhouse by Dutch designer Frederik Roijé might also be named bird villa. Our love for birds and design has transcended the birch wood birdhouse. 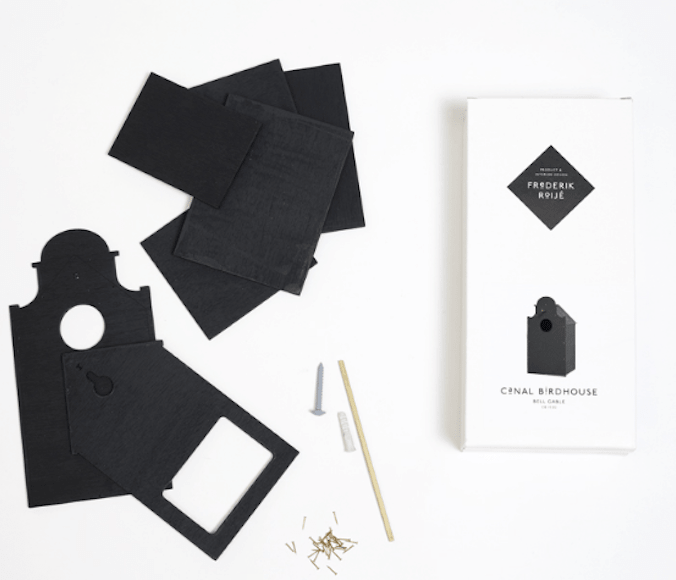 Frederik Roijé will also have thought such a thing when he worked on the concept for the Canal birdhouse. 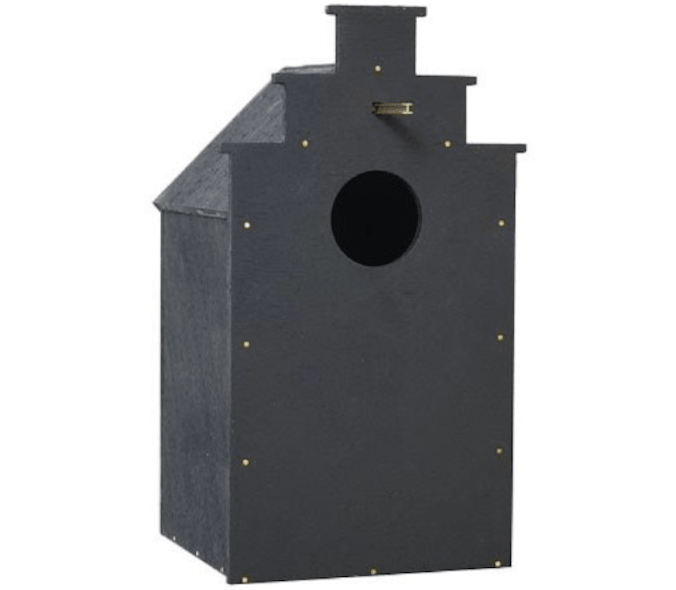 Do you offer the birds in your garden this beautiful black canal house as birdhouse? This birdhouse in the style of an Amsterdam canal house with a stepped gable or a clock facade is made of black stained and weather-resistant plywood, has a brass spring and brass nails to build the parts into a complete birdhouse. A plug and a nail to hang the box are also included. 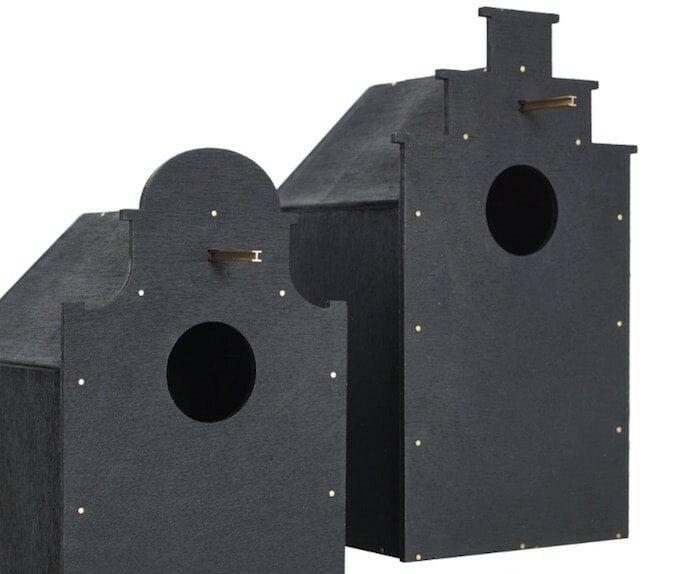 The birdhouse comes as a DIY building package delivered in a solid flat cardboard gift box. 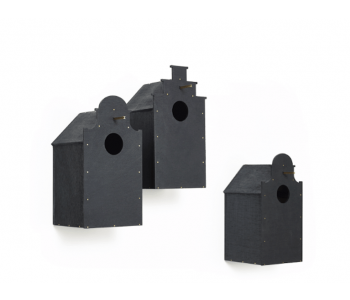 The Canal birdhouse box by Frederik Roijé is both beautiful and functional. Rather different from living in a dovecote or birdcage. Dutch Designer Frederik Roijé has transformed the iconic canal houses that adorn the city of Amsterdam into a beautiful bird box: the Canal birdhouse. This box is available as canal house with a clock facade or a stepped gable. Typical Dutch icons, which you can also find in the collection of the Rijksmuseum Amsterdam. Such a strikingly chic box, of course, everyone would like to have in the garden. It is, therefore, a popular gift for bird lovers, father's day, mother's day, for grandparents and of course for Christmas or a birthday.